Back in January, a friend challenged me to participate in an online art project called 100 Sticky Sketch Challenge. The idea was to draw one sketch a day on a 3×3 post-it note, starting February 1st, for 100 days. Each week there was a new topic, so there were seven post-it note sketches each week in each category. Participants were asked to post photos of their sketches on Tumblr, Facebook, Instagram, and Twitter, using the hashtag #stickysketch100 to share with the group. As you can see, I did accept the challenge. I had been looking for a way to inject more creative discipline into my days, and had actually been looking around for an interesting art class, in search of some structure and inspiring assignments. Although working on little yellow post-its didn’t appeal to me, it also didn’t seem at all daunting. They’re cheap, and if I needed to throw ten away to get one drawing I liked, it was no big deal. In fact, the crumminess of the paper made me feel that not every drawing had to be anything special, which was very freeing. And the small size presented constraints that limited the possibilities, which is always helpful to me when I’m feeling unfocused. The weekly themes were varied. Most were playful and fun, and I loved them. Some were challenging, in a good way. A favorite week: Choose your own adventure: seven drawings, one topic. I was ambivalent about some topics, and those were more of a struggle. Sometimes I was uninspired, and did something lame to get it over with. Some weeks I was busy and fell behind, so I did three or four drawings in one day to get caught up. I posted all my drawings on Facebook and Tumblr. It was fun to get comments on the sketches from friends. I also loved seeing the work that other people did, which was easy to do because of the hashtag. Except for the friend who challenged me, I didn’t know anybody else personally, but I began to recognize people by their drawings. It was great fun to see what everyone else was doing. Whether people are professionals or amateurs, there’s just no end to creativity. I made it to drawing #100 a few days ago. Towards the end, I was really looking forward to finishing. I had other things I wanted to work on. But the process brought a lot of insights, and I’ll really miss it. This entry was posted in community project, creative process and tagged post-it notes on May 14, 2015 by Helen Ellis. If you’re within striking distance of the Brooklyn Museum, check out “Judith Scott — Bound and Unbound,” thru March 29th. Pure amazingness! 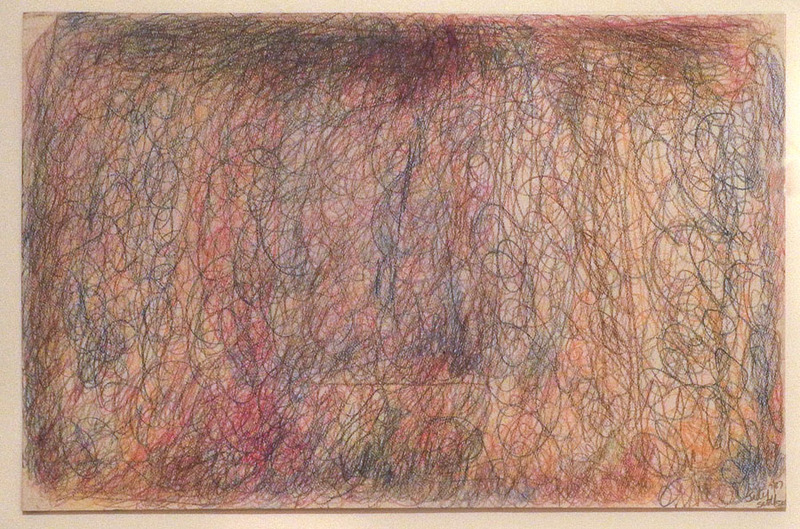 Scott, a highly recognized fiber artist, produced a lot of original and fascinating work and has a compelling story. And her story and her art prompt so many interesting questions and thoughts. 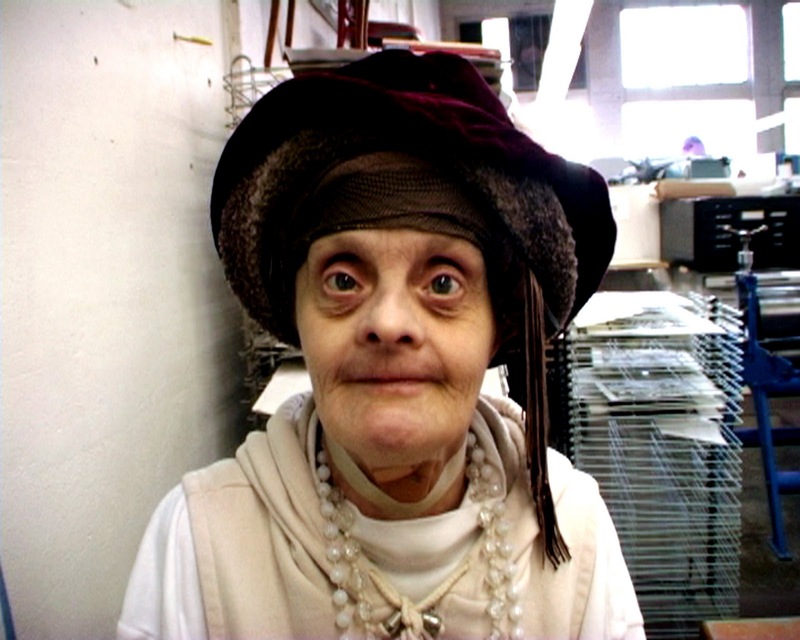 Diagnosed in infancy with Down’s Syndrome, deaf and mute, Scott was diagnosed as profoundly retarded and institutionalized until age 44, when she moved to the San Francisco Bay Area under the guardianship of Joyce, her twin sister. Joyce enrolled Judith in a studio art program at the Creative Growth Art Center in Oakland. Scott spent seventeen years there (she died in 2005), working six days a week, and created a highly regarded and widely collected body of fiber artworks. Scott arrived at Creative Growth in 1987 and produced a series of drawings in various mediums, samples of which are included in the show. The looping, repetitive forms, with mixed colors and occasional collage added, seem a precursor to her intricate and and mysterious sculptures. Once Scott was introduced to fiber, she had found her medium. Her earlier, totem-like works were bundled sticks wrapped with yarn and torn fabric. Scott’s process typically involved wrapping a found object armature with yarn, rope, thread, fabric and other fibers until the work had transfomed into what she considered a finished piece. She worked on a single piece at a time, sometimes for weeks or months, and when she had finished, she pushed it away and started in on something new. The armatures are sometimes partially visible, such as in these pieces, one built around blue plastic forms and another incorporating a rubber hose. Some of the works seem to reveal elements in a deliberate manner, as in this monochromatic work with loops of purple rubber hose peeking out. And sometimes what’s inside is a complete mystery. This work was constructed from paper towels which Scott collected when she found that she had run out of materials. The details — the colors, textures, wrapping, weaving, knotting — are varied and intricate. The sculptural forms are graceful, striking, complex, rich in color, movement, and expression. They prompt many associations for the viewer. And they prompt so many questions about the artist, her process, and the nature of creativity itself. Oh, sweet mystery of life! What is inside her beautiful, mysterious, package-like sculptures, and what was in Scott’s mind? Is her work an expression of an internal narrative? What informed her creative visions and decisions? Was her process purely intuitive? Was there intention and deliberation involved? What part does cognition play in creative process? Did Scott know she was creating an artwork? We will never know. And how many other people with mental disabilities, invisible to society, long written off as incapable of functioning, are also amazing artists? Wonderful, powerful food for thought. This entry was posted in creative process, disabled, inspiration and tagged fiber arts, Judith Scott, recycled materials on January 20, 2015 by Helen Ellis.